Fluorescent grow lights are one of the most popular options for home gardeners who want to start seeds and grow tomatoes indoors. In the past, standard fluorescents were primarily used for starting seedlings. Their inefficiency meant they weren't suitable for sustaining larger plants. But advances have changed that. High output and compact fluorescent lights emit more light, less heat, and a strong light spectrum than standard fluorescents and are significantly more efficient than incandescent lamps. They are now a favorite with home gardeners! Low heat output. Fluorescents put out very little heat, which allows them to be hung close to plants. That means plants under fluorescent grow lights get more light than plants under other kinds of lights – a top priority for indoor growers who always look for ways to maximize the amount of light plants receive. Light output. Standard fluorescents put out twice as much light as incandescent lamps. High output (HO) fluorescents produce twice as much light as standard fluorescent lamps. Convenience. Fluorescent fixtures are lightweight and easy to assemble. Replacement lamps are readily available. Affordability. Fluorescent systems are available for all budgets. Operational cost. Fluorescent lamps use less electricity than incandescent bulbs. Replacement lamps are affordable. Low noise level. A fluorescent grow light’s electronic ballast does not emit noise or vibration. Large selection. Fluorescent grow light systems are available in a variety of styles for the home gardener ranging from 2-tier and 3-tier standalone systems to small tabletop stands, as well as independent fluorescent fixtures which can be hung in your own custom set up. 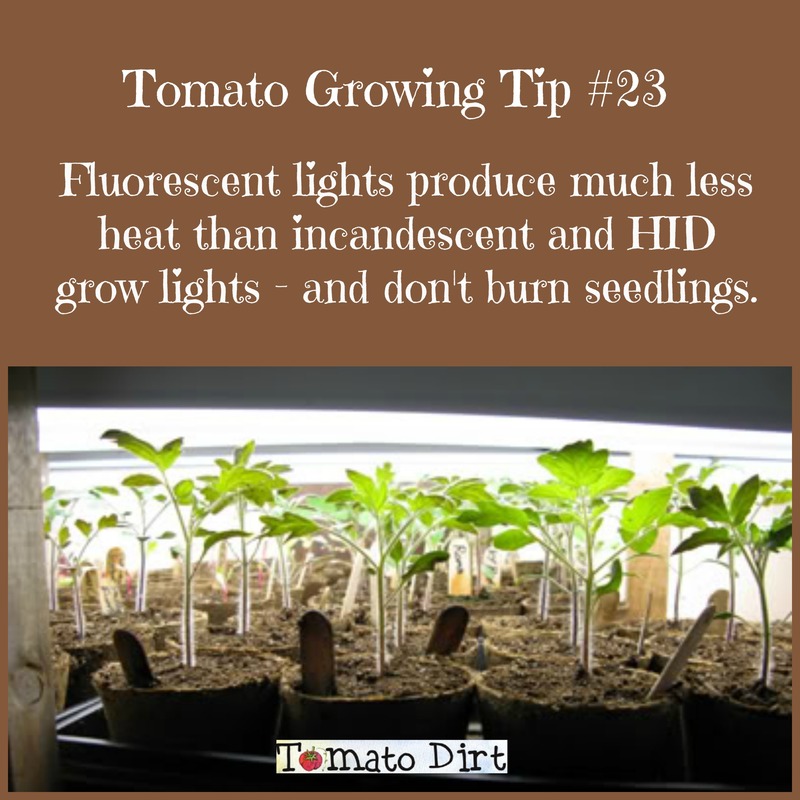 Tomato Dirt top tip: fluorescent lights produce much less heat than incandescent and HID grow lights. Set them close to plants for best results – no closer than 4 inches but no further than 24 inches. Closer is better. 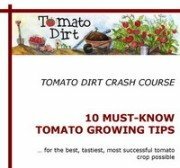 Seeds, seedlings, and tomato plants need darkness as well as light to grow. Keep plants under fluorescent lights 12-16 hours a day, but then turn them off. You can use an automatic timer to regulate the on-off switch. Decide how much room you want to dedicate to your grow light system. Structures are available as large units, mid-sized stand-alones, and tabletop arrangements. Use: best for starting seedlings and growing low-light plants. Standards fluorescents are also best used for growing leafy vegetables (like lettuce and spinach) and herbs. Use: primary light source for indoor growing; excellent for all growing uses including starting seeds, propagating cuttings, growing leafy vegetation, and flowering. HO fluorescents produce twice as much light as standard fluorescent lamps. Use: propagation and larger plants. Compacts are a smaller version of High Output (HO) fluorescents but have specially-designed reflectors to focus direct light to plants.